This Is Getting Old: Mini Miracle! This was the "Border War" and the "Battle for North America", and was perhaps the most hyped hockey game of the entire Olympics so far. It lived up to the hype, and much, much more. The United States pulled off a shocking 5-3 upset over powerhouse Canada Sunday night in Vancouver in front of thousands of stunned Canadien fans. This upset was not nearly to the magnitude of the one against the USSR in 1980, but it certainly felt that way to American hockey fans. USA rode a 42 save performance by goaltender Ryan Miller and a two goal night from Brian Rafalski to propel them to victory. Chris Drury and Jamie Langenbrunner also scored and Ryan Kesler added one of the most spectacular empty net goals ever scored to clinch the win for the Americans. 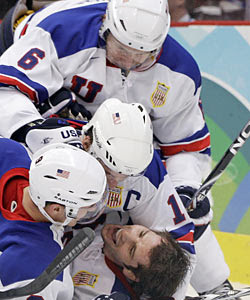 Canada's goals were scored by Eric Staal, Dany Heatley, and Sidney Crosby. This win also meant the USA has an automatic bye into the quarterfinals, and do not play until Wednesday against an opponent yet to be determined.